"Neuroanatomist Jill Bolte Taylor had an opportunity few brain scientists would wish for: One morning, she realized she was having a massive stroke. As it happened -- as she felt her brain functions slip away one by one, speech, movement, understanding -- she studied and remembered every moment. This is a powerful story of recovery and awareness -- of how our brains define us and connect us to the world and to one another." Image from WikipediaSent to me by a cardiologist friend with the subject, "Happy Hours in the lab are OVER." Thanks, Huck. "A possible role of social activity to explain differences in publication output among ecologists:"
Publication output is the standard by which scientific productivity is evaluated. Despite a plethora of papers on the issue of publication and citation biases, no study has so far considered a possible effect of social activities on publication output. One of the most frequent social activities in the world is drinking alcohol. In Europe, most alcohol is consumed as beer and, based on well known negative effects of alcohol consumption on cognitive performance, I predicted negative correlations between beer consumption and several measures of scientific performance. Using a survey from the Czech Republic, that has the highest per capita beer consumption rate in the world, I show that increasing per capita beer consumption is associated with lower numbers of papers, total citations, and citations per paper (a surrogate measure of paper quality). In addition I found the same predicted trends in comparison of two separate geographic areas within the Czech Republic that are also known to differ in beer consumption rates. These correlations are consistent with the possibility that leisure time social activities might influence the quality and quantity of scientific work and may be potential sources of publication and citation biases. ACE Inhibitors in Cardiovascular Disease — Unbeatable? 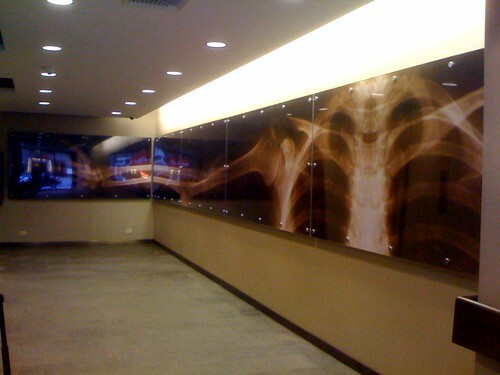 Questionable Choice for Doctor's Lobby Decor, originally uploaded by KidneyNotes. Green Urine. Happy St. Patrick's Day! Via The New England Journal of Medicine. Thanks to my wife, who's great at finding stuff like this. "What Would New York Women Do in Bed With Eliot Spitzer for $5,500?" It turns out, a whole lot.